CSD3317 and HRS9603: Human Rhythms is about working with physiological signals for beginners! The graduate version includes an extra project component and has the course number HRS9603. It is scheduled to run in fall 2019. Welcome to the SAFER Lab! We are located in the Faculty of Health Sciences in the National Centre for Audiology at Western University. Our research examines the human auditory system and the role that it plays in speech production. When we talk, the sound of our own voice is important in the accurate maintenance of speech. We study this by changing speech sounds in real-time (altered auditory feedback) and observing the influence on talking. We also study the auditory system by recording the sounds produced by the ear (otoacoustic emissions) or the electrical activity generated by the brain (auditory evoked potentials) in response to sound. We are particularly interested in the brain's response to speech sounds (speech evoked potentials). Read on for some examples or browse our publication list! Feel free to contact Dr. Purcell if you have any questions. People associated with the lab past and present can be visited here! Funded thesis based Masters and PhD degrees can be pursued in the SAFER Lab through the Hearing Science field in the Health & Rehabilitation Sciences Graduate Program or through the Graduate Program in Neuroscience. A funded, combined PhD and clinical Masters in Audiology (MClSc) is also an option. The research areas pursued in my laboratory will be of interest to students from psychology, neuroscience, communication sciences, physiology, medical biophysics, life sciences, health sciences, or other related areas. One of our interests is physiological measurements of auditory function such as otoacoustic emissions (OAEs) and steady-state auditory evoked potentials (the ASSR or SSAEP). We are interested in developing new ways of using the objective measurements that we have available, as well as relating these to performance in perceptual tasks. For example, we have developed methods of estimating auditory processing delays, as well as tools for evaluating the auditory brainstem's neural connections between ears (via the olivocochlear efferent system). We have studied how an individual's ability to detect amplitude modulation perceptually is related to their brain's ability to follow the modulated signal as measured electrophysiologically. Our recent work has explored the brain's envelope following response (the EFR) to individual vowel formants in speech. These vowel responses may have a practical application in validating newly fit hearing aids in very young listeners. We are also interested in how the brain follows the fine structure of speech, the frequency following response (the FFR). We also investigate the maintenance of accurate speech production, which is controlled in part by auditory feedback. We have been studying the control of vowel formants by manipulating them in real-time in the feedback provided to participants through headphones. Individuals compensate for errors introduced in the auditory feedback by changing their speech production. Relatively little is known about how the auditory vocal feedback system performs this task, and we have been working to better understand the phenomena and its mechanisms. John, M.S. and D.W. Purcell (2008). Chapter Two: Introduction to Technical Principles of Auditory Steady-State Response Testing. In G. Rance (Ed. 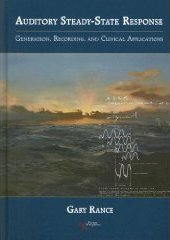 ), Auditory Steady-State Response: Generation, Recording and Clinical Applications, Plural Publishing Inc., San Diego , 11-53. Purcell, D.W. and H. Dajani (2008). Chapter Three: The Stimulus-Response Relationship in Auditory Steady-State Response Testing. In G. Rance (Ed. ), Auditory Steady-State Response: Generation, Recording and Clinical Applications, Plural Publishing Inc., San Diego , 55-82. Please note, this list often needs some updating! Boothalingam, S., Purcell, D.W., Allan, C., Allen, P. and Macpherson, E.A. (in press). Auditory Localization and Spatial Release from Masking in Children with Suspected Auditory Processing Disorder. Ear and Hearing. Easwar, V., Purcell, D.W., Aiken, S.J., Parsa, V. & Scollie, S.D. (2015). Evaluation of speech-evoked envelope following responses as an objective aided outcome measure: Effect of stimulus level, bandwidth, and amplification in adults with hearing loss. Ear & Hearing,36(6), 635-652. [This article won the 2015 American Auditory Society Editorï¿½s Award for Outstanding Research]. Easwar, V., Purcell, D.W., Aiken, S.J., Parsa, V. & Scollie, S.D. (2015). Effect of stimulus level and bandwidth on speech-evoked envelope following responses in adults with normal hearing. Ear & Hearing, 36(6), 619-634. Choi, J.M. , Purcell, D.W., Coyne, J.-A. & Aiken, S.J. (2013). Envelope Following Responses Elicited By English Sentences. Ear & Hearing, 34(5): 637-650. Easwar, V. , Purcell, D.W. & Scollie, S. (2012). Electroacoustic comparison of hearing aid output of phonemes in running speech versus isolation: Implications for aided cortical auditory evoked potentials (CAEP) testing. International Journal of Otolaryngology, 2012, 10 pages. Glista, D. , Easwar, V., Purcell, D.W. & Scollie S. (2012). A Pilot Study on Cortical Auditory Evoked Potentials (CAEPs) in Children: Aided CAEPs change with Frequency Compression Hearing Aid Technology. International Journal of Otolaryngology, 2012, 12 pages. Easwar, V. , Glista, D., Purcell, D.W. & Scollie, S. (2012). The effect of stimulus choice on cortical auditory evoked potentials (CAEP): Consideration of speech segment positioning within naturally produced speech. International Journal of Audiology, 51, 926-931. Easwar, V. , Glista, D., Purcell, D.W. & Scollie, S. (2012). Hearing aid processing changes tone burst onset: Effect on cortical auditory evoked potentials in individuals with normal audiometric thresholds. American Journal of Audiology, 21, 82-90. Mitsuya, T., MacDonald, E., Purcell, D.W. & Munhall, K. (2011). A cross-language study of compensation in response to real-time formant perturbation. Journal of the Acoustical Society of America, 130, 2978-2986. Choi, J.M. , Purcell, D.W. & John, M.S. (2011). Phase stability of auditory steady state responses in newborn infants. Ear & Hearing, 32(5): 593-604. Butler, B.E. , Purcell, D.W. & Allen, P. (2011). Contralateral inhibition of distortion product otoacoustic emissions in children with auditory processing disorders. International Journal of Audiology, 50(8): 530-539. MacDonald, E., Purcell, D.W. & Munhall, K.G. (2011). Probing the independence of formant control using altered auditory feedback. Journal of the Acoustical Society of America, 129(2) : 955-965. Purcell, D.W. & John, M.S. (2010). Evaluating the Modulation Transfer Function of Auditory Steady State Responses in the 65 Hz to 120 Hz Range. Ear & Hearing, 31(5): 667-678. Purcell, D. W., Butler, B. E., Saunders, T. J., and Allen, P. (2008). Distortion product otoacoustic emission contralateral suppression functions obtained with ramped stimuli. Journal of the Acoustical Society of America 124(4), 2133-2148. Purcell, D. W., Ross, B., Picton, T. W., and Pantev, C. (2007). Cortical responses to the 2f1-f2 combination tone measured indirectly using magnetoencephalography. Journal of the Acoustical Society of America 122(2), 992-1003. Purcell, D. W. and K. Munhall (2006). Adaptive control of vowel formant frequency: Evidence from real-time formant manipulation. Journal of the Acoustical Society of America 120(2), 966-977. Purcell, D. W., P. Van Roon , M. S. John , and T. Picton (2006). Simultaneous Latency Estimations for Distortion Product Otoacoustic Emissions and Envelope Following Responses. Journal of the Acoustical Society of America 119(5), 2869-2880. Purcell, D. W. and K. Munhall (2006). Compensation Following Real-time Manipulation of Formants in Isolated Vowels. Journal of the Acoustical Society of America 119(4), 2288-2297. Dajani, H., D. W. Purcell, W. Wong, H. Kunov, and T. W. Picton (2005). Recording human evoked potentials that follow the pitch contour of a natural vowel. IEEE Transactions on Biomedical Engineering 52, 1614-1618. Purcell, D. W., M. S. John, B. A. Schneider and T. W. Picton (2004). Human temporal auditory acuity as assessed by auditory steady state responses. Journal of the Acoustical Society of America 116(6), 3581-3593. Purcell, D. W., H. Kunov and W. Cleghorn (2003). Estimating bone conduction transfer functions using otoacoustic emissions. Journal of the Acoustical Society of America 114(2), 907-18. Purcell, D. W., M. S. John and T. W. Picton (2003). Concurrent measurement of distortion product otoacoustic emissions and auditory steady state evoked potentials. Hearing Research 176(1-2), 128-41. Picton, T. W., M. S. John, A. Dimitrijevic and D. Purcell (2003). Human auditory steady-state responses. International Journal of Audiology 42(4), 177-219. Picton, T. W., M. S. John, D. W. Purcell and G. Plourde (2003). Human auditory steady-state responses: the effects of recording technique and state of arousal. Anesthesia & Analgesia 97(5), 1396-402. John, M. S., D. W. Purcell, A. Dimitrijevic and T. W. Picton (2002). Advantages and caveats when recording steady-state responses to multiple simultaneous stimuli. Journal of the American Academy of Audiology 13(5), 246-59. Dimitrijevic, A., M. S. John, P. Van Roon, D. W. Purcell, J. Adamonis, J. Ostroff, J. M. Nedzelski and T. W. Picton (2002). Estimating the audiogram using multiple auditory steady-state responses. Journal of the American Academy of Audiology 13(4), 205-24. Purcell, D., H. Kunov and W. Cleghorn (1999). Objective calibration of bone conductors using otoacoustic emissions. Ear & Hearing 20(5), 375-92. Purcell, D., H. Kunov, P. Madsen and W. Cleghorn (1998). Distortion product otoacoustic emissions stimulated through bone conduction. Ear & Hearing 19(5), 362-70. Please note, this list also needs some updating! A course intended for beginners with no prior programming or signals experience! An introduction to the basics of conditioning and analyzing physiological signals measured from the human body. Topics include linear systems and signals, filtering, removing artifacts, averaging, and time and frequency representations. Example human data includes the brain, heart, muscles, and speech! Beginners will learn some MathWorks MATLAB programing to complete signal analysis exercises with Dr. Purcell. This course covers the fundamentals required in the study of hearing. Knowledge of the basics of acoustics and hearing are also required to study speech. The three main areas of the course are acoustics, anatomy/physiology, and psychoacoustics. Acoustics includes the physics of sound, as well as the analysis tools used to produce and quantify it. The structure (anatomy) and function (physiology) of the auditory system are intertwined, and shape our perception of sound. By studying the perception of sound (psychoacoustics or psychophysics), we break the illusion of direct perception. The sound we perceive has been highly processed and abstracted from the physical stimulus. This course covers the fundamentals of some powerful tools that we have for evaluating the auditory system from the hair cells in the cochlea to the brain. These include, from the ear upwards, otoacoustic emissions and auditory evoked potentials. There are numerous subdivisions within auditory evoked potentials that are largely based on the delay between the stimulus and the response. Measurement of these responses gives us information about auditory processing and helps us to identify individuals with hearing impairments, and to diagnose the nature of the disorders. The Auditory Steady-State Response (ASSR) is a relatively new electrophysiological measurement technique that has great promise for rapid screening and threshold estimation in special populations like infants. While much work has been done to identify the characteristics of the ASSR, there is still a great deal to be learned. This ongoing and future work will necessarily involve the clinical populations of interest and therefore will require the participation and skills of audiologists with a background in the response. The purpose of this seminar course is to give Audiology students the opportunity to critically study the literature on the development of the ASSR and to give them the knowledge to participate in future clinical based research that will make the ASSR a clinically viable part of the assessment battery. This seminar will also assist future Audiologists to critically make decisions about the development of assessment protocols in their future clinical practice.